Note, TURF analysis functionality is available as an SPSS Statistics extension (accessible via the Extension Hub) in v24 onwards. 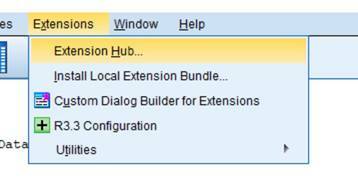 You can access the Extension Hub via the Extension menu, as per the screen grab below. Once in the Extension Hub, simply search for “TURF” and install the extension. If you are running an earlier version of SPSS then talk to us today about upgrading to the latest version in order to get access to TURF analysis.